Peter Reaveley is an English expatriate presently living in Florida, who grew up in Yorkshire, England, near Flamborough Head, the site of the great battle between Bonhomme Richard and Serapis. After a lifetime in the aviation industry, Peter retired in 2001 to devote all of his time to his 40-year quest to find the remains of the Bonhomme Richard. Peter has collected more than 30 eyewitness accounts of the battle and its aftermath written by officers and men on the ships and people onshore. He has collaborated with the French naval historian Jean Boudriot on the book "John Paul Jones and Bonhomme Richard" and written the chapter describing the battle with Serapis. The book is still the standard reference work on the ship and the battle. For the past five years Peter has served as historical researcher to the Ocean Technology Foundation and the Underwater Archaeology Branch of the U.S. Naval History and Heritage Command, in this joint project to locate the remains of the Bonhomme Richard. Captain John Paul Jones left the French port of L'Orient on Saturday, August 14, 1779 in the Bonhomme Richard. 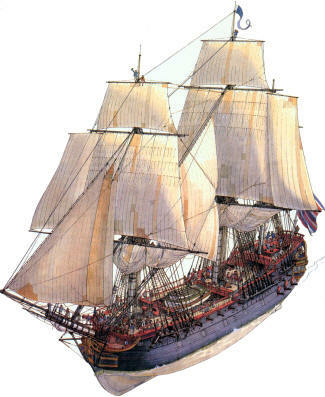 He sailed around the British Isles, and encountered and defeated HMS Serapis on Thursday evening, September 23, 1779. Bonhomme Richard sank 36 hours later on Saturday morning, September 25, 1779. Jones sailed off in the Serapis, reaching Texel, Holland on Saturday, October 2. How did Jones, and the British seeking to find him after the battle, navigate and record their tracks, and can these ship logs provide clues about most probable sinking position for the Bonhomme Richard? • The logbook for the Bonhomme Richard covers the period before the battle with Serapis, but goes no farther. The original manuscript of the log was lost in a fire in 1940, but fortunately the log was type scripted prior to the fire. • The logbook for the Serapis, under American control after the battle, covers the period from just after the sinking of the Bonhomme Richard until Serapis arrived at Texel, Holland. This might allow us to determine the ship’s course by working backward from the Texel to the Bonhomme Richard’s sinking almost a week prior. 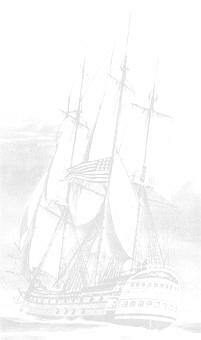 • The logbooks from the fleet of British warships that pursued Jones in the days following the battle might offer constraints as to where Jones could not have been, since the British were unsuccessful in sighting or capturing him. In order to interpret these logs, an understanding of navigation methods and equipment in the Age of Sail is required. During the late 18th century, there were two complementary methods of sea navigation: “Coastal Navigation” and “Deep-Sea Navigation.” The difference between the two methods was one of context. A ship engaged in the coastal trade might use coastal navigation most of the time. But a ship engaged in deep-sea voyages between different countries might use coastal navigation within 20 to 30 miles of its port of departure, then deep-sea navigation, and finally coastal navigation again when within 20 to 30 miles of its port of destination. Coastal navigation was used when a ship sailing between ports remained within 5 miles to 20 miles offshore, laying a course well offshore but still keeping in sight headlands, lighthouses, seaports, or large noticeable features like church towers or steeples on the coast. Such landmarks were shown on the coastal charts, as well as “soundings” (water depth at low water), known shoals, the direction of the flood tide, safe anchorages in five to ten fathoms of water, and “leading-lines,” or safe approaches to harbors (Figure 1). Figure 1a. A 1794 navigation chart showing soundings and landmarks near Flamborough Head. Figure 1b. Enlargement showing the lighthouse on Flamborough Head, soundings, and the shoal in Bridlington Bay. Coastal charts also showed the type of seabed, for example, mud, sand, shells, or shingle (small stones). 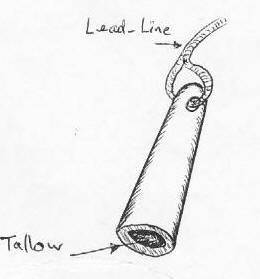 When the “sounding-lead” (Figure 2) was cast and its base hit the seabed, some material would stick to the soft tallow inset into the end. The lead-line also showed the depth of the water, assisting the captain, or Sailing Master on a ship-of-war, to check his position on the chart. The “hand-lead-line” could be used while the ship maintained slow headway in 20 fathoms or less. The line was marked at different depths by colored pieces of cloth or leather to provide the leadsman with quick indications of the water depth, which he immediately shouted to the quarterdeck officer. The deep-sea lead-line required the ship to be hove-to, and could measure up to 100 fathoms, being marked with two knots at 20 fathoms, three knots at 30 fathoms, etc. The deep-sea lead-line also had a tallow inset to take a sample of the seabed. The coastal chart could be supplemented by even more details in the annually-published, “Coasting Pilot” for that area, which would provide highly detailed information on buoys, marks in channels, and the best approaches to harbors to remain clear of shoals. Let us take a coastal voyage between two ports. The correct title for the Captain of a merchant ship was “Master,” as in “Master Mariner,” but in practice the courtesy term “Captain” was used. On merchant ships, the Master-Captain and his First Mate were responsible for navigating the ship. The Captain of a ship-of-war, although theoretically responsible for navigation, usually delegated this to his “Sailing Master”, shortened to “Master.” The Sailing Master (today's Navigation Officer) ranked as an officer and messed with them in the wardroom. The Captain and the other naval officers could navigate, but did not see it as their primary duty. 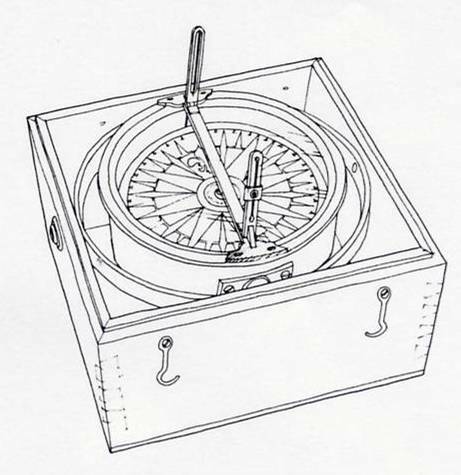 As the ship proceeded the Master or Master’s Mate would take regular bearings on passing landmarks with a “bearing compass,” which was a simple, portable, wood-box compass fitted with two thin brass vanes (Figure 7). The Master would enter into his log book the time, the name of the landmark, and the compass bearing. He would then apply magnetic variation to derive the bearing of the landmark with respect to true north, the reference used on all charts. The reciprocal of this true bearing was a position-line, which would be drawn on the chart in pencil from the landmark out to sea. The ship lay somewhere along this position-line at the time the bearing was taken. In theory, the Master would then take a bearing on another landmark, repeat the procedure, and the intersection of the two position-lines would be the position of the ship (sailing ships typically made only 6 knots to 7 knots, so plenty of time was available to perform these simple calculations). In practice, Masters rarely took two bearings, since all officers could estimate distance offshore fairly accurately using the formula: “the observer’s horizon in nautical miles equals the square root of the observer’s height in feet above sea level multiplied by 1.17.” In practice, seamen used a multiplication factor of 1.2. The Master standing on the quarterdeck 25 feet above sea level had a horizon of √ 25 x 1.2 = 6 miles, and could clearly see the waterline of a passing ship, or breakers along the coastline at this distance. A 100-foot high steeple or lighthouse would add: √ 100 = 10 x 1.2 = 12 miles for a total of 18 miles, or even farther if the church or lighthouse was on higher ground. However, the Master would need to identify the landmark, so he would need to see at least a part of it. He would estimate distances as 12 to 15 miles, or 15 to 18 miles offshore, depending upon the height of the landmark and would record these distances as “4 to 5 leagues,” or “5 to 6 leagues,” a "league" being 3 nautical miles. The Master would then simply mark off on his plotted position-line the estimated distance, which he could measure with his dividers from the vertical latitude scale at the sides of the chart, since one minute of latitude equals 1 nautical mile. This simple “bearing and distance” position-fixing would be repeated every hour if possible and the results entered into the log book (Figure 3), and the positions plotted on the chart. Figure 3. Page from the log of Winchelsea, part of the British squadron trying to overtake John Paul Jones after the Battle of Flamborough Head. Click here for a closer view of the logbook. The Master would use his telescope to identify the landmarks if the ship was well offshore. All officers of merchant and naval ships provided their own navigational equipment, including day and night telescopes, a quadrant, a Gunter’s scale, parallel rulers, and a fitted case of navigational instruments including protractors, dividers, pens, and pencils. Our Master would own two telescopes: a “long-glass”, which was a one-piece wooden tube approximately 4 feet long, sometimes covered in leather, with the object lens mounted in a brass ring at one end, and the eyepiece lens mounted in a small brass tube at the other end, which could be adjusted to the observer’s eyesight. A long-glass was heavy and awkward to use on a pitching rolling ship, but it had a magnification factor of 15x to 20x. The Master's “night glass” was only 2 to 3 feet long, and had a wider-aperture object lens to permit more light to enter the telescope at twilight-dawn or twilight-dusk, or at night by the light of the moon or stars. Although a night-glass only had a magnification factor of 10x to 12x it was widely used by day, since it was so convenient to handle on a ship. Using his charts and these simple navigational methods and equipment, the Captain or Master of a sailing ship could safely navigate round-trip coastal voyages of several hundred miles. The ship’s log, or "journal" was the daily record of the ship’s course, speed, and significant events. The log was a large hard-cover book, about 11” x 17”, since each page had to contain a lot of information vital to the ship’s safety. 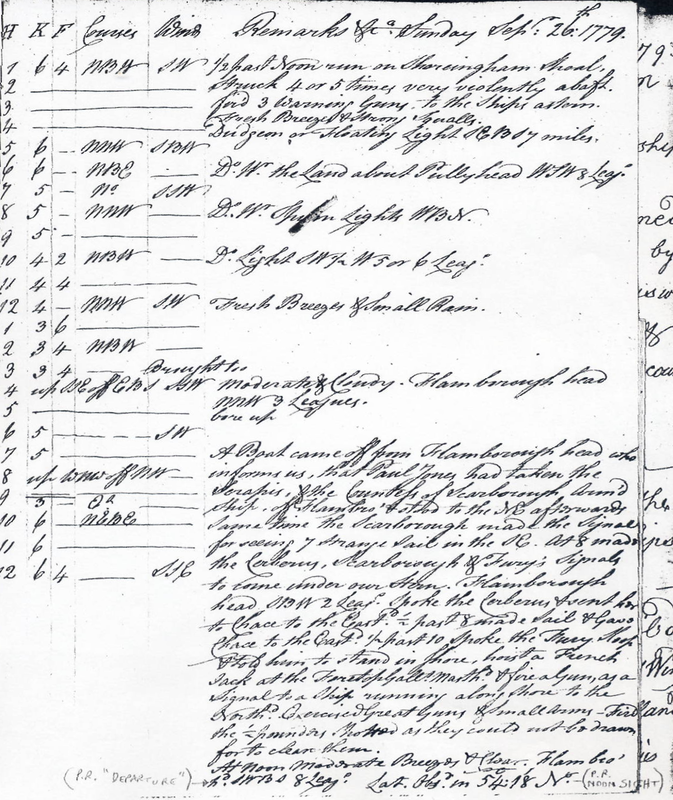 A typical ship’s log was ruled in vertical columns on each page (Figure 4). The Ship’s Log played a vital role in both coastal navigation and deep-sea navigation, and when properly kept, enabled the Master to calculate the ship’s position at any time, and especially at 12 noon each day. The ship’s log ran for the 24 hours of the ship’s day, from 12 noon on Day 1 to 12 noon on Day 2, with the calendar date of Day 2. Thus the log in Figure 4 ran from 12 noon on Wednesday, 18th August to 12 noon on Thursday, 19th August 1779. The “H” column was for each hour of the ship’s 24-hour day. The first 12 hours would be the PM hours on the day before, and the second 12 hours the AM hours of the calendar day. The “K” and “HK” columns recorded the ship’s headway, or speed through the water, in Knots and Half-Knots as measured by casting the log-line every hour. 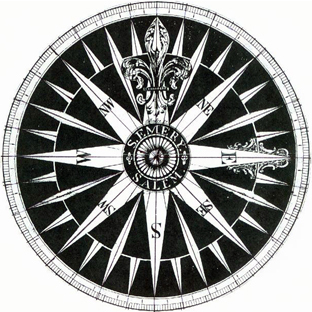 The “Courses” column showed the compass course steered by the helmsman during that hour, with the compass course being expressed in terms of the 32 “points” of the Mariner’s Compass (Figure 5): “N” (North), “NbE (North by East), “NNE” (North-North-East). Each ‘point’ of the compass is 11¼ degrees, so in modern terms that would be 360°, 011°, 022°, etc. The log always recorded the course to that direction in terms of compass north, not true north. The “Winds” column recorded the direction from which the wind was blowing, and the winds shown in the log were also expressed in terms of compass north. The wind strength and its trends were very important, since as wind velocity increases the strength of the wind increases almost as the square of the wind velocity. The winds at the height of the top-sails and top-gallant sails 100 feet to 150 feet above the sea would be up to 10 knots stronger than the wind at sea level. This is the reason a ship’s sails are made smaller in area higher on the masts (Figure 6). The “Remarks” column also included any significant sail changes and significant events. If Magnetic Variation or windage leeway had been specifically observed, these values also would be recorded. This day begins with pleasant weather. Deep-sea navigation was used when the ship was sailing out of sight of land. It relied on accurately recording the ship’s compass course each hour, the ship’s speed as measured by the log-line, and any significant changes in the wind which might affect the ship’s leeway due to windage. Windage leeway was a significant problem since ships had very little keel area, and would be driven off course downwind by the wind pressure on the sails and hull. The ship’s course steered by the helmsman was rarely the ship’s actual Course-Made-Good. Generally speaking, under any given wind conditions a sailing ship made more leeway at lower speeds than at higher speeds. A ship also made more leeway with the wind directly on her beam, or with the wind one point either side of her beam, than with the wind on her quarter. The ship’s leeway could be observed if a Midshipman or Mate took a Bearing-Compass (Figure 7) to measure the bearing of the ship’s wake. The reciprocal of that bearing compared with the ship’s compass course would be its leeway, but there are very few log entries indicating that this was regularly practiced. Most Masters probably just estimated leeway from the winds in the log. Figure 7. Bearing Compass. Image: J. Boudriot. Let us now briefly describe the Compass used for steering, and the Log-Line used for measuring the speed of a ship. The helmsman stood at the ship’s wheel, which was located directly behind the compass binnacle. The binnacle was a large oak case with a steering compass mounted on either side, so the helmsman could always see a compass. Under most conditions the best a helmsman could do would be to steer within one point of a given course. The center of the binnacle contained a fish-oil lamp, mounted on gimbals, which illuminated the compasses at night. The helmsman’s steering compass comprised a single magnetized steel needle mounted on a compass card engraved with the 32 points of the Mariner’s Compass (Figure 5). The compass card and pivot were mounted in a gimbaled wooden box that could oscillate fore and aft, and from side to side (Figure 8). Figure 8. Steering compass. Like the bearing compass, this would be mounted in the gimbaled box so the needle could remain horizontal as the ship heaved and rolled. The forward face of the inside of the inner wooden box had a thin black line painted on a white background to permit the compass to be aligned with the ship’s keel. The Captain also had an inverted “hanging compass” mounted on a deck beam on the ceiling of his sleeping cabin, to check on the ship’s course while he was resting. The ship’s headway, or speed through the water, was measured in “knots,” and the term is derived from the knots located on the log-line which was run out every hour. This measured the distance the ship had run from a fixed point in the water during a fixed time, both distance and time being the same relative fraction of a nautical mile and an hour. For example, 50 feet is 1/120th of a 6,000 foot nautical mile, and 30 seconds is 1/120th of an hour. The fixed point in the water was a wooden “log-chip” which was approximately a quarter section of a circle, five to six inches on its straight edges, and ¼" to ½" thick, and weighted on its curved edge so that it would sit vertically in the water relatively motionless. The log-chip, attached to approximately 150 fathoms of thin line on a reel held by a seaman (Figure 9), was dropped over the lee side of the stern of the ship every hour. As the line ran out a red rag appeared on the line, indicating that the log-chip was now more than a ship’s length aft of the ship, and it should be relatively stationary in the water. The log-line was now marked with knots every 50 feet of its length. As the red rag appeared the reel-man shouted “Turn!”, and a seaman holding a 30-second glass turned the glass. The reel-man then counted the knots as they ran off the reel. When the seaman holding the 30-second glass saw the glass was empty, he shouted “Stop!” and the reel-man stopped the reel. The number of knots run out was then the speed of the ship. Because of its importance, a Midshipman or Master’s Mate usually supervised this operation. Figure 9. Log-line, log-chip, and log-reel. In practice, many ships used knots spaced 48 feet apart (8 fathoms), and also used a sand-glass of 28.8 seconds, usually shortened to 28 seconds. Other ships used knots spaced 42 feet apart (7 fathoms), with a 28-second glass, depending upon the personal preferences of the Captain or Master. All officers knew that the log chip was never truly stationary, and that even a second of error in turning the glass, or shouting “Stop!” could result in an error in the speed logged. However, the ship’s Course-Made-Good also was probably only accurate to plus or minus one point of the compass (11°), so hopefully these errors cancelled out over the length of the 24-hour ship’s day, and during the many weeks or months of long ocean voyages. The hourly entries in the ship’s log were reviewed by the Master shortly after 12 noon each day, as soon as the noon sighting of the sun had been made. If you return to Figure 3, the log of the Winchelsea, at the bottom right of the page you can read "Latitude Observation 54˚18' N". By adding together with a simple “traverse table” all the courses steered (corrected for leeway) and speeds run on each “tack,” the Master would now have one single value of “Course-Made-Good” and one single value for “Distance Run.” The Master would then correct this Compass Course-Made-Good for Magnetic Variation to derive his True "Course Made." The “Course Made” and “Distance Made” would now form the isosceles of a right-angle triangle, in which the North-South axis would be the difference in latitude in miles, and the East-West axis would be difference in longitude in miles (Figure 10). Since he already had the latitude and longitude calculated at 12 noon the previous day, he only needed to convert miles run N-S and E-W into degrees and minutes of latitude and longitude, and apply the difference in latitude, and the "departure," or difference in longitude, to yesterday’s lat/long position to derive today’s’ lat/long position. By definition one nautical mile equals one minute of latitude, and 60 nautical miles equals one degree of latitude. The ‘miles difference’ in latitude was therefore directly the ‘latitude-difference’ made during the past 24 hours. Thus 93 miles of latitude = 93 minutes of latitude = 1 degree 33 minutes of latitude. The conversion of ‘miles-run’ E-W into longitude was more complex than the conversion of latitude N-S due to the convergence of the meridians towards the poles. One degree of longitude equals 60 miles at the equator, but only approximately 47 miles at 39˚N at Annapolis. The Master solved a simple problem in trigonometry by assuming that the ship’s course and distance formed the hypotenuse of a right-angled triangle. The "miles-difference" east -west was divided by the cosine of the mid-latitude. Thus, at 39˚ N: 93 miles / cos(39) (0.70772) = 120' = 2˚ of longitude. A Nautical Table of sines, cosines, and tangents allowed him to perform this operation, and he could also use his Gunter’s Scale. The Gunter’s Scale was a one-foot or two-foot-long hard wooden ruler engraved on one edge with inches and tenths of inches for measuring (Figure 11). On each side the scale had a set of finely engraved horizontal lines of logarithms, sines, cosines, tangents and secants. Using his divider on the relevant scale, the Master could quickly solve this series of simple trigonometrical problems. The Gunter’s Scale was the precursor to the slide-rule. Figure 11. One-foot-long Gunter’s Scale (top) and a close-up version (bottom.) Images: International Slide Rule Museum. With the "difference" in latitude, and his "departure," or "difference" in longitude the Master had now derived today's Dead Reckoning position at 12 noon. All of the ship’s officers knew that this “Dead Reckoning” or "D.R." position was just an estimated position, based upon data of variable quality and basic trigonometry. It was therefore important to take a sighting of the altitude of the sun at its zenith above the horizon at local noon, if at all possible, since this altitude is directly related to the observer’s latitude. However, he needed to know the specific date since the earth rotates around the sun on an axis inclined at approximately 23.5°, and in 1779 the sun was overhead at the equator at the equinoxes on March 20 and September 23, and over the Tropic of Cancer (23.5°N) or Capricorn (23.5°S) at the solstices on June 21 and December 21. The master would consult the Nautical Almanac to get the sun-hour-angle for that specific date, and several correction factors. The Master and all officers would take their noon sun-sight using a quadrant (Figure 12), the precursor to the sextant, which was just coming into use at that time. The Master could now compare his “D.R. Latitude” with his more accurate “Observed Latitude,” and if necessary correct his D.R. Latitude at the time he plotted it on the chart. Figure 12. Quadrant used in 18th century navigation. The Master also needed to review his D.R. Longitude. However, because most ships’ officers could not perform the more than one-hour of complex astronomical navigation calculations required in celestial navigation using moon-star hour-angles, nor readily identify many of the several thousand stars then visible in the sky, the astronomical calculation of “observed longitude” was usually not possible in the 18th century. An alternative would have been to use the “Equation-of-Time,” based upon the fact that there are 360° of longitude around the earth, and the earth rotates on its axis once every 24 hours. Therefore, every hour the earth rotates 15° of longitude, and every 4 minutes of time equals one degree of longitude. However, since accurate watches were rare, extremely expensive, and difficult to keep safe in a sailing ship environment, this method of determining longitude also was not available. The Master's longitude derived from his D.R. calculations therefore probably remained unchanged, and for the next century, after a couple of weeks at sea, most deep-sea ships had no idea of their real longitude to within 50 to 100 miles. We mentioned that the Master needed to correct his compass “Course-Made-Good” from compass, or magnetic north, into true north to plot the course on his chart. Magnetic Variation is the angular difference between True North and Magnetic North, and Variation differs over time at the same location, and is different at different locations on the earth’s surface. Variation can be significant, and in the seas around Britain and France in 1779 Magnetic North was 22° (two points of the compass) west of True North. The simplest method to determine Magnetic Variation was for the Master to sight Polaris with a bearing compass, and directly read off the angular difference between True North and Compass North. He could also use his bearing compass to sight the angle at which the sun rose in the morning and then set in the evening, and check those values against that date in the tables in the Nautical Almanac. That would give him the true bearings of sunrise or sunset for that date, which he could directly compare with his compass bearings to derive magnetic variation. “Magnetic Deviation,” or the difference between Compass North and Magnetic North, was known but not understood. “Deviation” was caused by the natural magnetic fields of the often several hundred tons of ships’ iron ballast, cannons, shot, anchors, fixtures and fittings, etc. Since seamen of that time knew about but did not understand this form of compass variation, they just included “deviation” in “variation.” However, the officer of the watch knew that when the ship was under way he was never to wear his sword or his pistols near the compass binnacle. Having derived the ship’s Dead Reckoning position at noon that day the Master would now prick that position on the chart with his dividers, and join today's position to the previous day’s position with a pen-line, which represented the Course-Made and Distance-Made. He would then place today’s date alongside today’s position at 12-noon as shown in Figure 13. Figure 13. An illustration of “Course Made” and “Distance Made.” Image: P. Reaveley. The Captain could now observe the overall progress of the ship, and knowing the present wind conditions decide what course to steer to best reach a position near his destination at the same latitude as his destination. He would then carefully tack back and forth along this latitude, taking soundings and maintaining a good lookout until reaching the coast (Figure 14). The bottom of Figure 3 includes these computations, which were much more important when the ship was not in sight of a known landmark. Made the land of Holland near the Texel, bearing EbS distant 5 leagues. A pilot came on board. Figure 14. Excerpt from the log of the Serapis. Although thousands of ships were lost at sea in storms, or ran ashore due to navigation problems, tens of thousands of ships sailed the world for more than 300 years using latitude, log, lead, and lookout. As we’ve seen, the logs from the Bonhomme Richard and Serapis can be very helpful in learning about how the ships were sailed, the crew’s actions, and each ship’s sailing capabilities. The understandable but unfortunate lack of log-keeping during the hours immediately after the battle up until the time the Bonhomme Richard sank only adds to the many challenges of locating its final resting place. Azimuth: direction of an object, measured clockwise around the observer's horizon from north. So an object due north has an azimuth of 360°, one due east 090°, south 180° and west 270°. 2. A Journall Kept on Board the Serapis, an English Ship of War, of 44 Guns taken the 23rd.of September, (by the Bon Homme Richard,) now Commanded by the Honble. John Paul Jones. Manuscript, New York Historical Society, New York. Typescript," The LOGS of the SERAPIS - ALLIANCE - ARIEL under the command of JOHN PAUL JONES, 1779 - 1780 " , Barnes, John S., Ed., Naval History Society, New York, 1911. 3. His Brittanic Majesty's Frigate WINCHELSEA, 32 Guns, Captain Charles Saxton, Captains Logs, 1779, Admiralty Records, ADM 1 / 2484 , U.K. National Archives, London. 4. A New Hydrographical Survey of the East Coast of England, Flamborough to Berwick, Maps Library, Maps 1066 (13 ), 1794, British Library, London. 5. Bathe, Basil W., Ed., " THE VISUAL ENCYCLOPEDIA OF NAUTICAL TERMS UNDER SAIL " , New York, 1978. 6. Boudriot, Jean, " The Seventy Four Gun Ship ", First published in France in 1977. English edition translated by David Roberts, revised and corrected , Staples, Rochester, England, 1988, Volume 2 and Volume 4. 7. Falconer, William, " AN UNIVERSAL DICTIONARY OF THE MARINE ",LONDON,1780, David and Charles Reprints, Newton Abbot, Devon,1970. 8. Hutchinson, William, " A Treatise on Practical Seamanship ", Liverpool, 1777, Reprinted, Scolar Press, London, 1979. 9. Kemp, Peter, Ed., " The Oxford Companion to Ships and the Sea ", Oxford University Press, Oxford, 1976, Reprinted with corrections, 1988.